I am a big fan of historically-based TV shows. The beautiful sets and sumptuous costuming make me want to immediately raid the nearest fabric store and get sewing. The more I learn about history and the reasons why people wore what they wore, the more I realize that, as gorgeous as the costuming in this shows is, they are not always exactly… accurate to the time period they are depicting. This is often a deliberate choice by the costumers as these shows are not usually intended to be historically accurate, but as dramas with a historical setting used to entertain an audience. This is particularly true of the CW’s Reign. Premiering in 2013, Reign loosely follows the life of Queen Mary Stuart, otherwise known as Mary, Queen of Scots, and her marriage to the french dauphin (crown prince), Francis. Now it goes without saying that most of the characters in this show have been aged up because when the events covered by Reign first start, Francis and Mary are both in their early teens. Now at the time, they would have been considered to be “adults” but to a contemporary audience, this would definitely not be the case. One thing that has been particularly fascinating about this show is the deliberate choice to keep the background characters (for the most part) historically accurate, then dressing the young main cast in hybridizations of historically-inspired and modern couture gowns. It creates a very intentional contrast between Mary and her retinue and the other members of the French court, implying that their more avant garde sense of style was a result of their foreign upbringing and their innate other-ness within the court. With that being said, I thought it would be fun to go through some of the costumes of Reign and compare them to contemporary portraits of some of the main characters. I wanted to start with gown created for Mary and Francis’s wedding in season 1 because it was just so beautiful. Her dress is showpiece of white lace with a gorgeous illusion neckline and a sparkling beaded belt. It’s elegant, romantic, and totally princessy. This is a gown that, as a modern girl, I would be happy to wear for my own wedding. It manages to be formal without being overly fussy and conservative, and looks like it was really comfortable to wear. This is a portrait of the real Mary Stuart in her wedding gown. As you can see, the only thing they really have in common is that they are both white and have long sleeves and a lace collar. This was quite a shocking statement at the time as, in the French court, white was the colour death and mourning, so wearing white for her wedding was considered a very grim omen. Gowns worn by court ladies of the mid-sixteenth century often featured high, ruffled collars like in the portrait below. The large hanging sleeves and the thick gold chain that she wears are another way of showcasing her wealth and status. The more modern styling is seen throughout every season of Reign. We not only see the characters in sleeveless gowns, but sometimes even in strapless ones. I love the gowns that the actresses are given for their scenes. Most of them look like they were taken straight off the runway of an Alexander McQueen show. The rich brocades and lace fabrics chosen for the dresses would have marked them as being quite wealthy, but in the sixteenth century, with their shoulders and arms bare, they would have been completely scandalous. It was far more common at the time for women to be fully covered, with high collars and long sleeves. The bodices of the gowns themselves usually hand low-square necklines, but they were often paired with something called a “partlet”, which was a sleeveless garment made of linen or silk. In the early sixteenth century, partlets of black velvet were in high demand among the upper classes. Another common trend in the Elizabethan era was to match the partlet and sleeves with blackwork embroidery. The most elaborate partlets were made from a lattice of pearls and jeweled beads. Of course, not all of the gowns in the series are modern. They are, however, much closer to storybook-princess than Elizabethan lady. Bonnets and other head coverings were also worn by most women. The heart-shaped bonnet was particularly popular. Mary Stuart was known for wearing bonnets of openworked white lace, though variations on the yeoman’s hats were also popular at the time. Hair was often pinned up and back, the nobility dressing their locks with jeweled pins, gold rings, feathers, and small glass ornaments. Contrary to this, the women in Reign tend to wear their hair uncovered, and down around their shoulders. It’s a really flattering look to the actresses because they all have really beautiful long hair, but would have been very uncommon at the time. 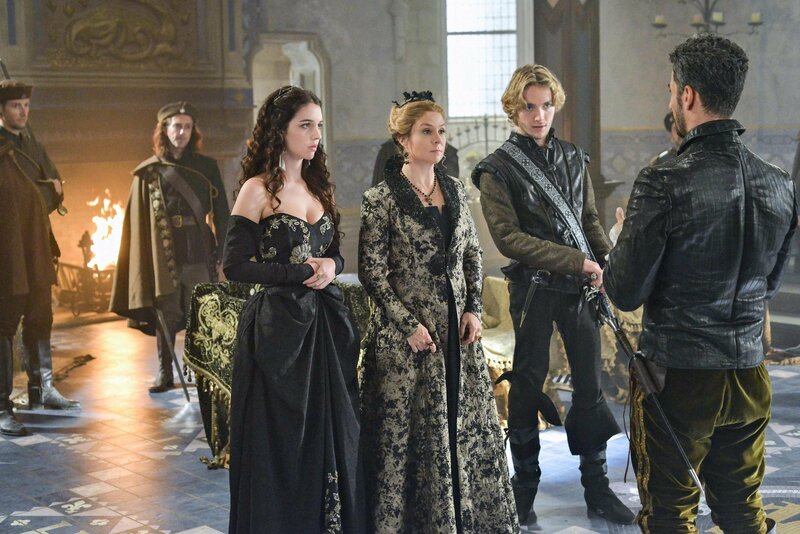 The men’s costumes in Reign are every bit as gorgeous as the outfits worn by the ladies, however they do tend to lean more toward the Victorian era than the Elizabethan, something I find to be surprisingly common in history-based media. Actually, in some of the scenes, Mary’s husband Francis bears a striking resemblance to Queen Victoria’s husband Albert. 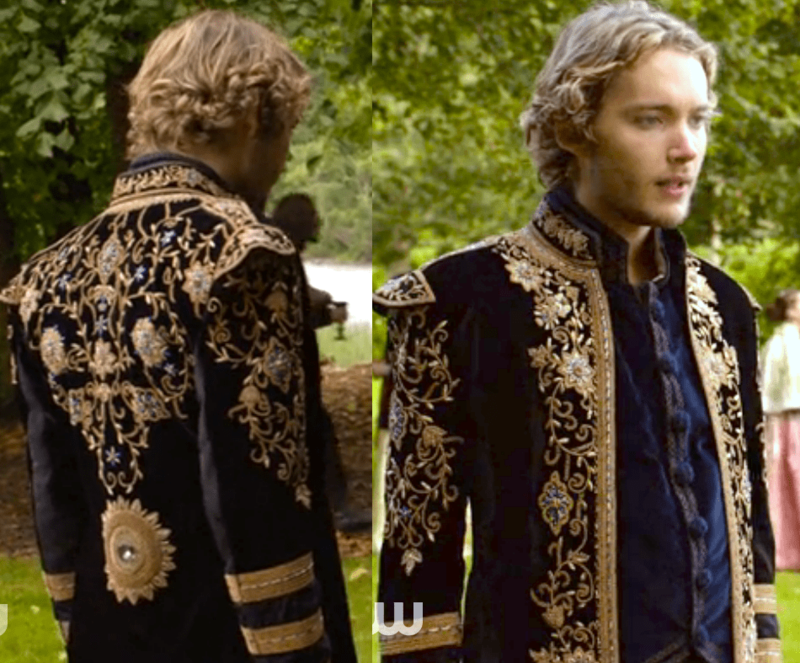 Pictured here, Reign’s Francis is wearing what looks like a cross between a Victorian military jacket, and a heavily embroidered 18th century coat. The detail work put into this garment is stunning and it shows very well on screen as a show of wealth and opulence, but is very different from what a man in the 1500’s would wear. Some of his jackets are tailored shorter and are of a more accurate length, but paired with long pants and swashbuckling boots, I definitely get more of a “Dread Pirate Roberts” feel from the design. The choices made in the cut and colour of Francis’s wardrobe are very well thought out, creating deliberate contrast between him and his father, King Henry. Henry is portrayed in the show as wearing bold colors and rich reds, adhering to the more historically-accurate silhouettes that the designers have used for the older characters. By contrast, Francis wears a lot of black and darker tones, his jackets kept intentionally undone for a more youthful, casual look. This is a portrait of the real Francis II, painted in the late 1550’s. As you can see, men’s clothing in the sixteenth century featured the same fitted bodices and high collars that women’s clothing did. Doublets tended to be shorter, with a flared peplum issuing from a Basque waist. These were worn with breeches — which were much shorter and poofier than we see in later centuries — and long hose. At this time the shape of a man’s legs was considered particularly attractive, so it was very important that the hose be fitted properly in order to showcase the musculature of the calves. Francis’s mother, Catherine de Medici, is a particularly interesting character both in the show and in reality. Her family was a powerhouse in medieval Europe and Catherine was known for being a strong and influential woman in her own right. In Reign, Catherine’s gowns are a standout from the rest. They tend to be much more conservative than those worn by the other court ladies, and while their outfits tend to be a lot more modern, many of Catherine’s costumes are reminiscent of the medieval houppelande — a long surcoat that belted at the waist. So in this case, going a couple of centuries backwards instead of forwards. As with the other ladies, she wears her hair uncovered, but pinned up in a style that was more common in the eighteenth century. One costume that I must commend them on is Catherine’s red gown from season 3. This one is an absolute stunner. The beaded partlet and heavily embroidered sleeves are a work of art and comparatively it is one of her most historically accurate costumes in the show. Catherine de Medici’s own gowns were works of art in their own right. The dress shown below is made from several meters of black silk velvet, beaded head to toe with gold and pearls. In addition to costing a king’s ransom to have made, this ensemble would have been incredibly heavy to wear, and that would be without the addition of the rich fur oversleeves that have been sewn onto the dress. I hope you’ve enjoyed this look at the costumes of Reign and the fashions of the mid-sixteenth century. Are there any period tv shows you really enjoy? Let me know in the comments and I will feature them in an upcoming article!